Posted August 15, 2016 by admin & filed under Dental Implants, Family Dental Care, General Dentistry, Restorative Dentistry. If you and your dentist have decided that you will undergo dental implant surgery, you’re probably wondering what to expect. Dental implant surgery is usually done as an outpatient procedure through multiple stages. If you have a damaged tooth that the dental implant is replacing, your implant dentist will remove it and prepare your jaw for the implant surgery. When you chew, you exert great pressure on your jawbone. If your jawbone isn’t thick enough or is too soft to support the dental implant, the device will fail. So, often bone grafting is required. 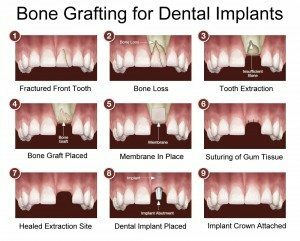 In bone grafting, another piece of bone either from a different part of your jaw or freeze-dried bone that is sterilized bone from a bone bank is transplanted into your jawbone. Depending on the size and location of the tooth where where the implants are going, the healing time will vary between six and 16 weeks. Sometimes, minor grafting can be done at the same time as dental implant surgery. Once the extraction area is healed, the next step is for the dentist to place the titanium implant post into your jawbone. They must then grow together. This process is called osseointegration and it can take up to six months for the bone and post to fuse together. But, it is important because it creates a strong, solid base for your new replacement tooth. That titanium post acts like the root in your natural teeth. In many cases, the surgeon can also place the abutment onto the post at the same time.